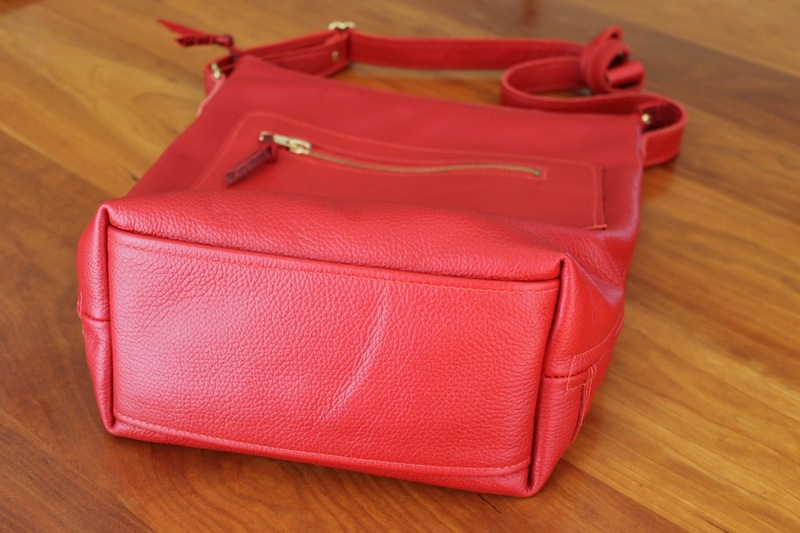 I had enough of this red leather to make two Delta totes and this final Keller Bucket. 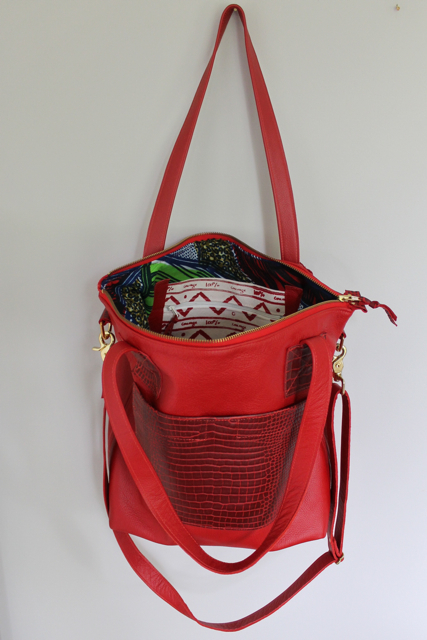 The first three Delta totes (green, red and toffee) have all sold which is fabulous and I thank you all for your support. 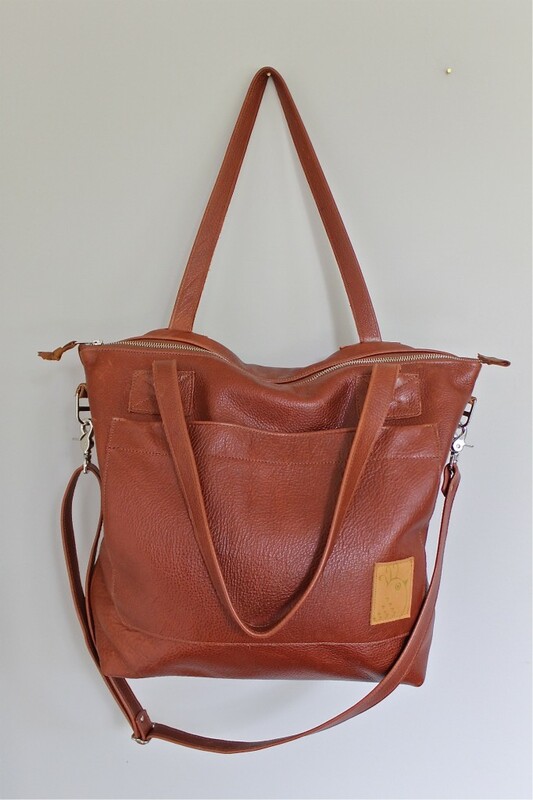 It was so great to see birdbrain leather bags on the arms of rug hookers at the show last weekend! The last red Delta will be in the shop tomorrow with this Keller Bucket soon after. 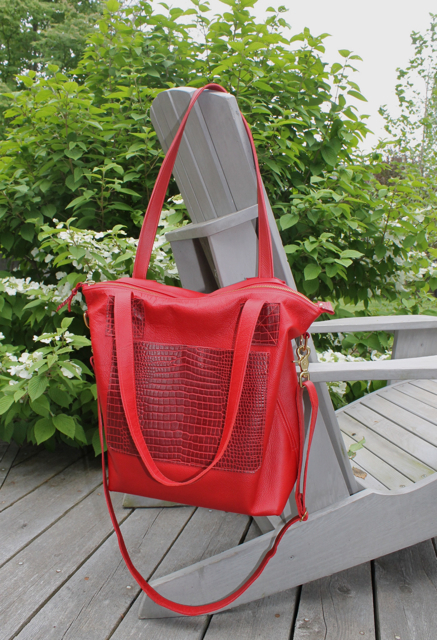 This lastest bag is 11.5″ wide and 13″ high with a four inch double leather base, an adjustable shoulder strap and the Keller zip pocket on the front. 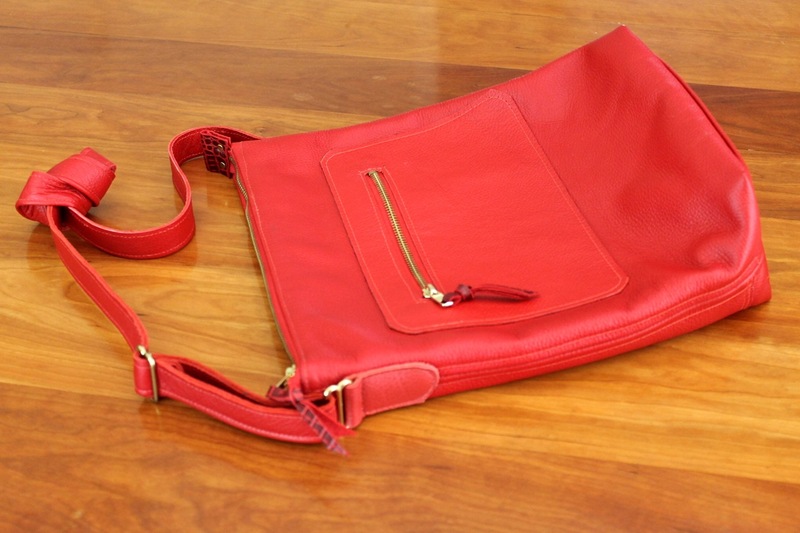 Inside it has a leather phone pocket and a canvas double pocket, zipper and slip. 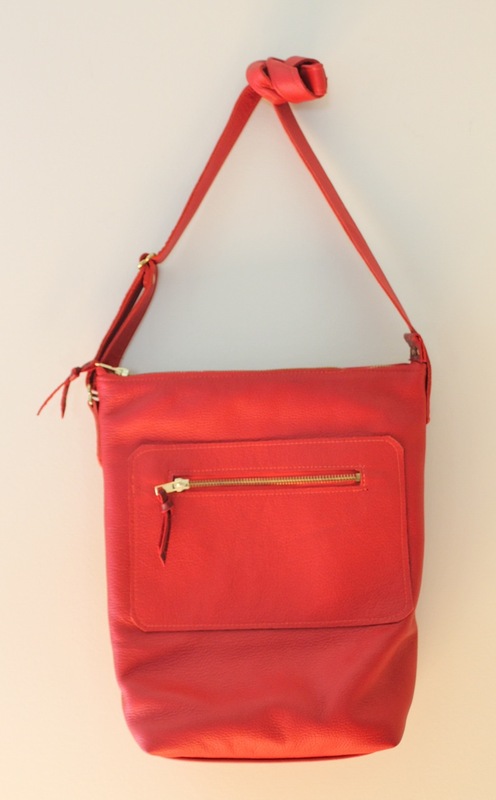 This flash of red is a great g0-to bag–throw it over your shoulder and carry all you need. 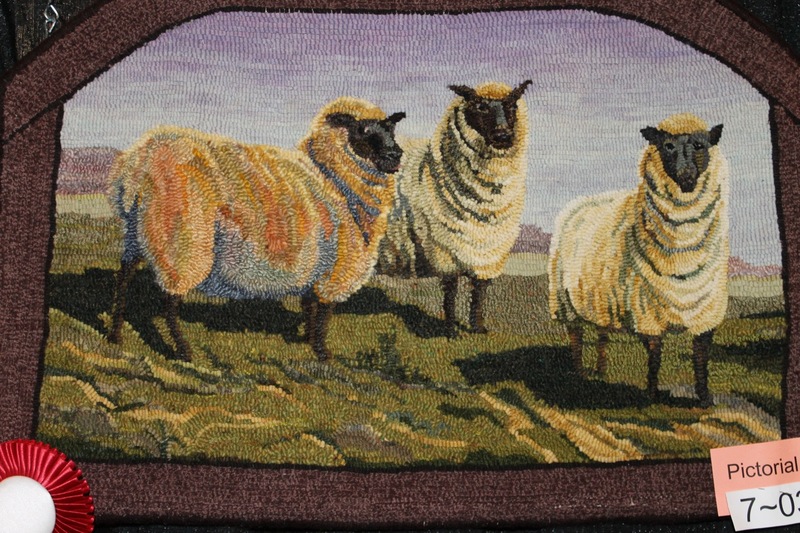 Here is the winning rug in the pictorial category, designed and hooked by Pat Bonn of the Ottawa Olde Forge rug hooking group. Thanks to those who helped me with this! There is another winner too, Joan Foster, of the Moira Mat Makers, whose bell pull won in the alternative fibres category. I was not able to get a good photo of this piece but have decided to include a photo of the group display, just to give you some idea. 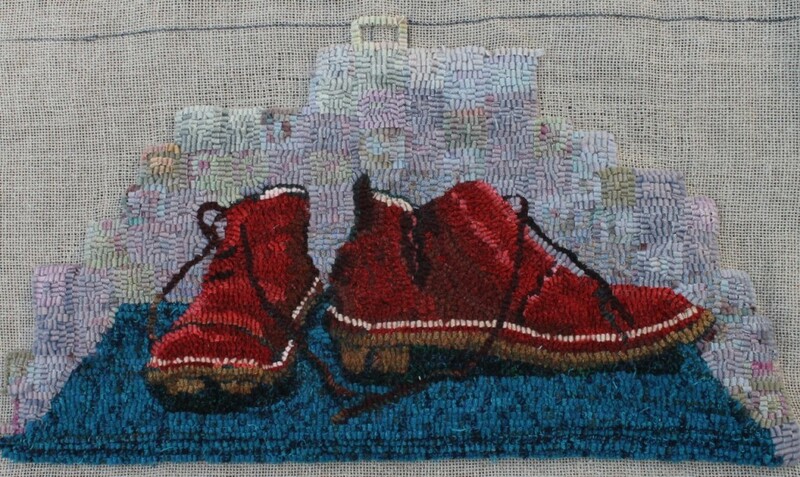 Since Joan is in my rug hooking group, I will arrange to get a good photo of this marvellous piece and post it here soon. 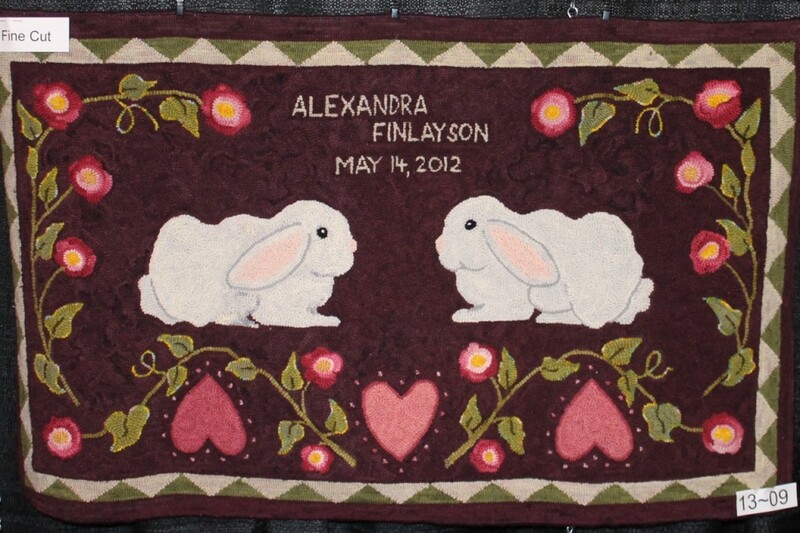 Following are some rugs which caught my eye. These are not all of the amazing rugs at the show–just a taste. 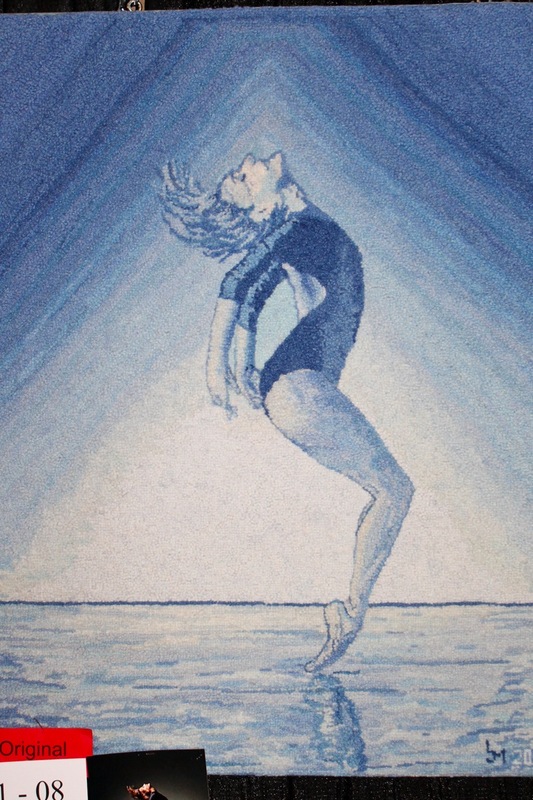 First is Lois Morris’ gymnast. I kept returning to look at this piece; it was very powerful. 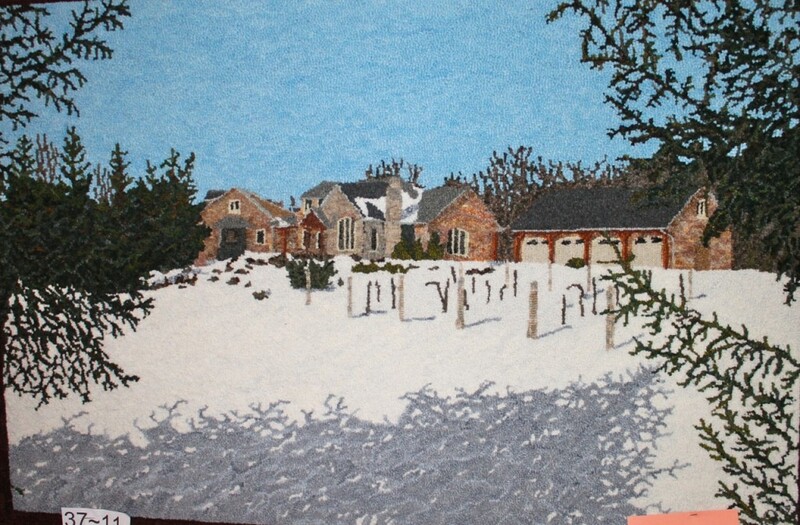 Below is a pictorial by Trish Johnson, Fluff and Puff by Gail Finlayson and a wonderful snow scene by Gunda Gamble. 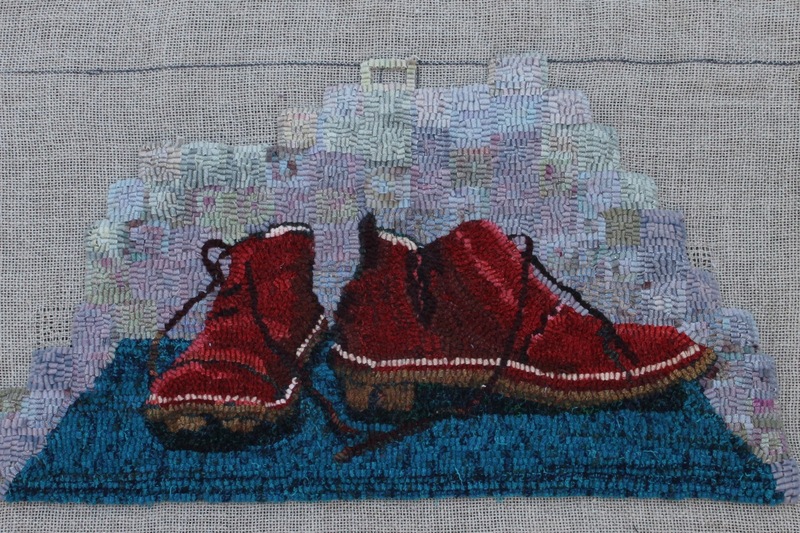 And finally, a rug which I love, from featured artist Joan Boyle. 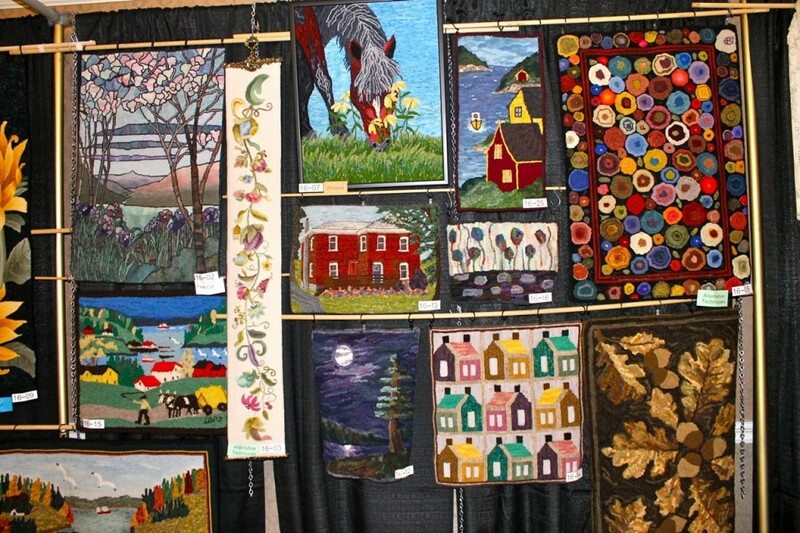 The Ontario Rug Hookers held their 43rd Annual Conference in Kingston on the weekend. It was a marvellous weekend on all counts–congratulations and thanks to Area 1 and the Limestone Loopers! 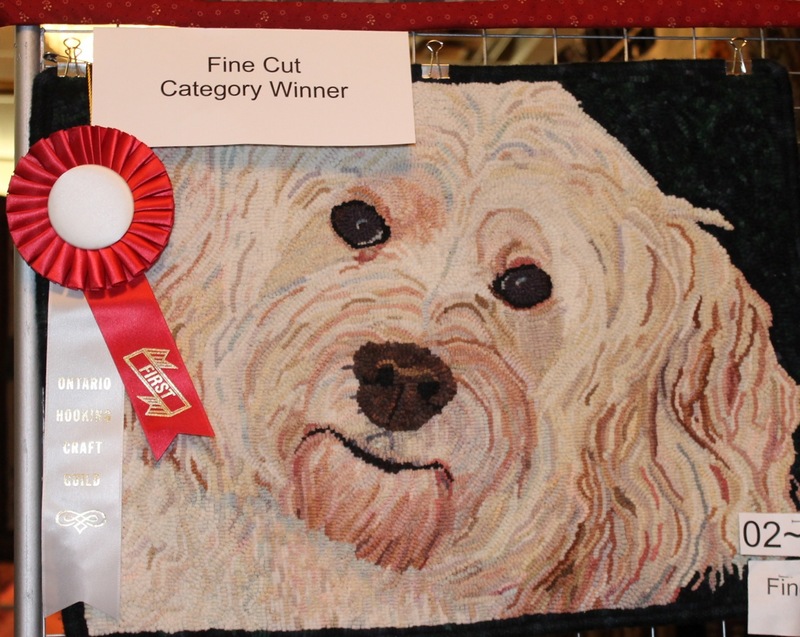 It is always a challenge to get good photos of rugs hanging in a display–here are some of the award winners. More tomorrow. There were so many amazing rugs there. Above is Rhonda Kellet’s adorable pup the winner for fine-cut and below Gloria Jonkman’s sunflowers which was the winner in the wide-cut category. 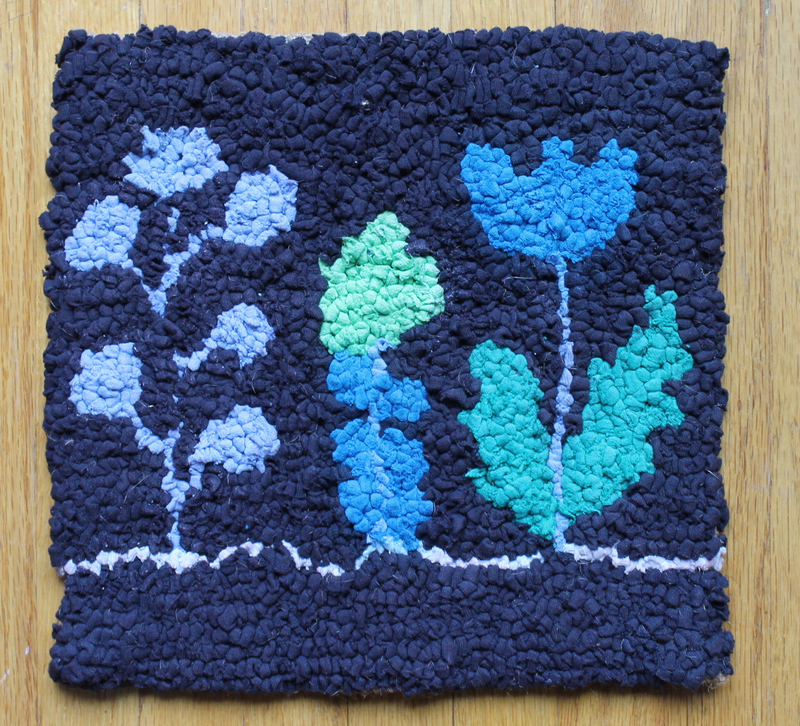 Below is Dolores Detschel’s Caterpillar rug (which had us all guessing)– the Rowan award winner, followed by Karen Kaiser’s winner in the theme award category and Nancy Fox’s winner in the original category. Another Delta tote is finished. 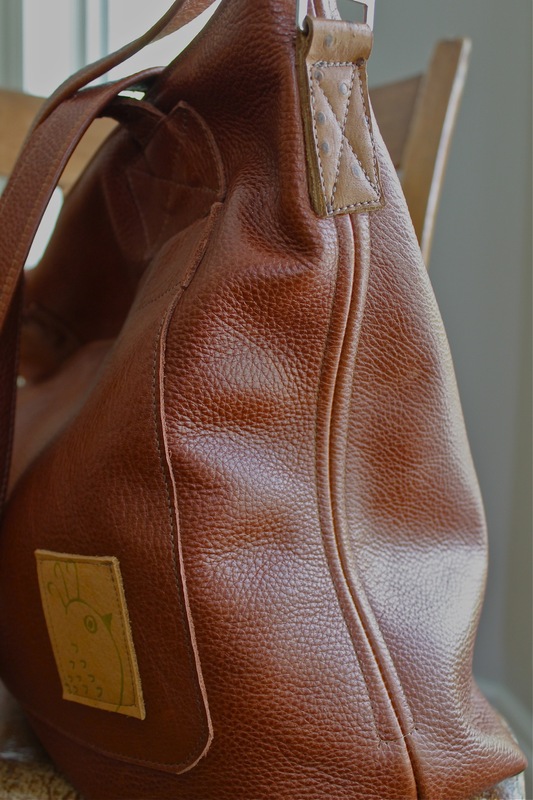 I posted close-up pictures here which better show the grain of the leather. 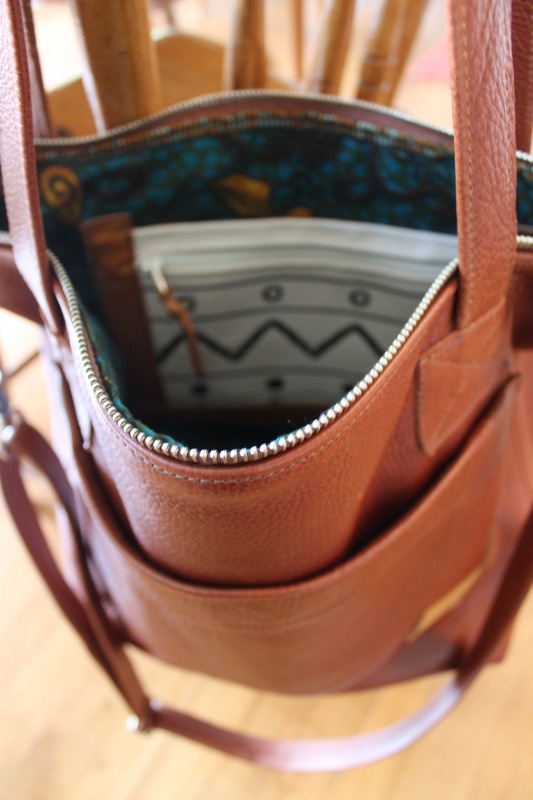 But these pictures show the size and usefulness of the tote. It is 17″ wide, 14″ tall with a 5″ reinforced bottom with metal studs to protect it from scrapes. 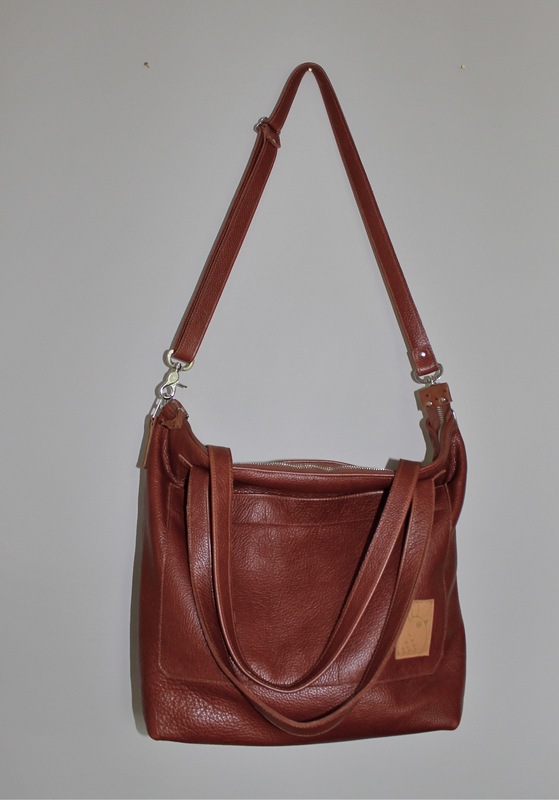 There are two carry options, a long adjustable shoulder strap which you can remove or two handles which also fit easily on your shoulders. As I’ve said before, I think it’s great to have options when you are carrying lots. 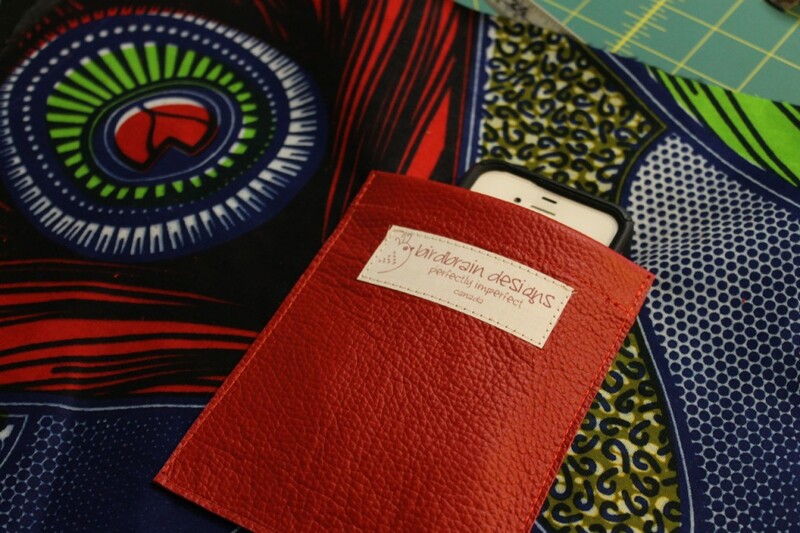 On the front is a big pocket which closes with a strong magnetic fastener and inside is a phone pocket and a screen-printed canvas pocket with both zipper section and slip section behind. 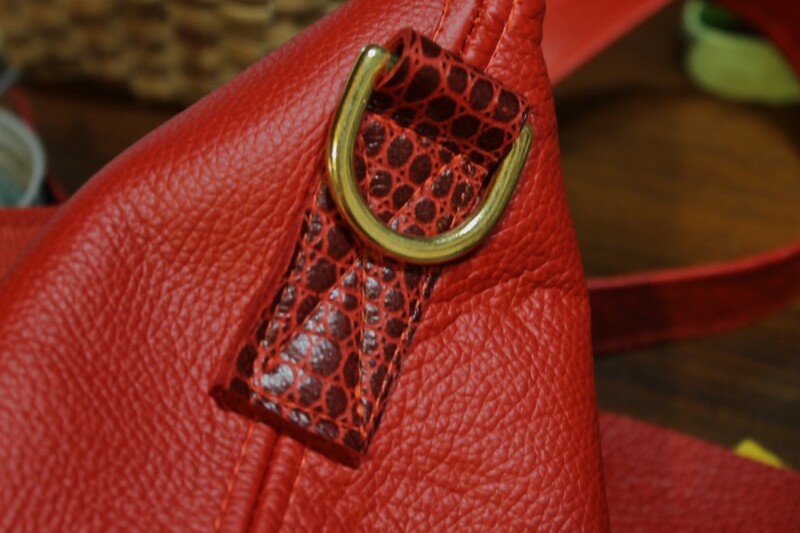 The zipper is a bronze metalic one and the other fastenings match. 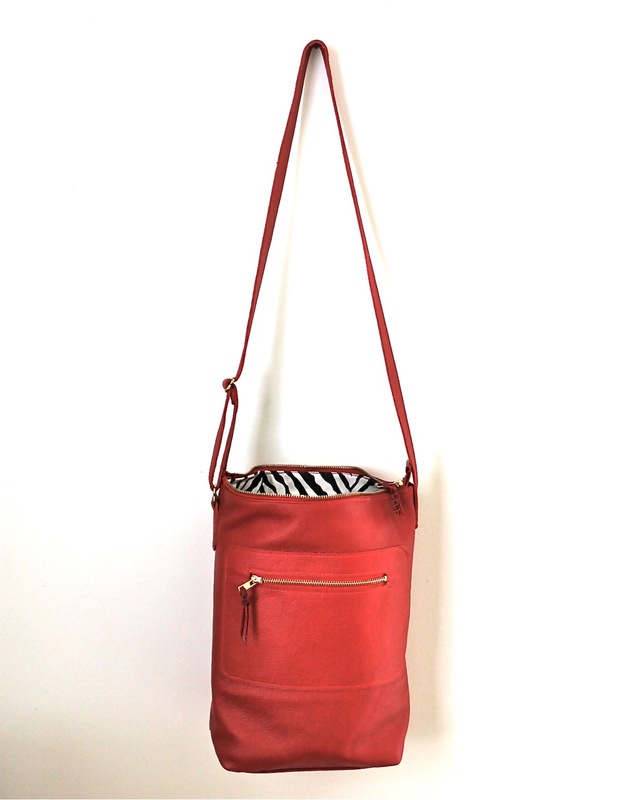 All in all, this is a sturdy, roomy tote which is great for travel or just for carrying lots of stuff. 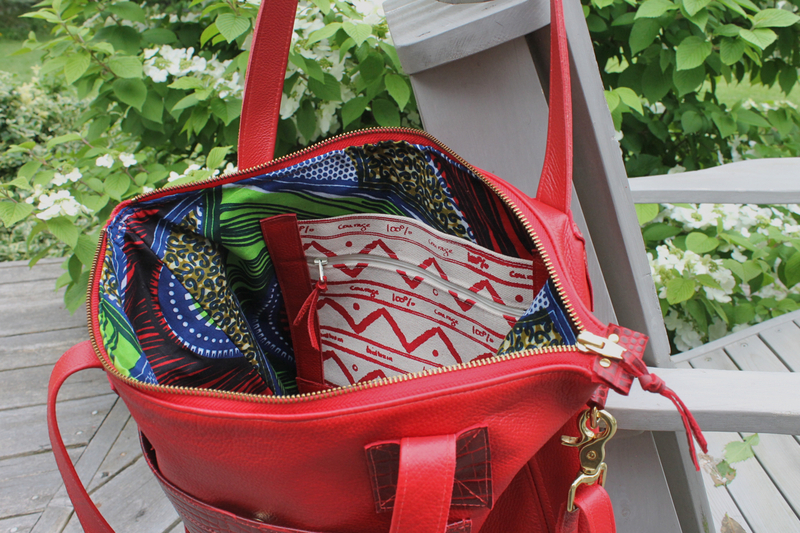 And I shouldn’t forget to mention the stunning wax print lining–the colours of Africa. I was at our rug hooking group again this morning. We meet in our city’s wonderful new recreation centre, gathered around a table drinking tea, swapping stories, sharing health care advice and…hooking. We have been meeting together for a long time now, Wednesday mornings. It began in a member’s home, but we have long outgrown that space and time. Now we rent a spot and share the building with swimmers and yoga enthusiasts. In our room, the glass wall barely contains all the colours of our imaginations. As my friend MA walked me to my car today, she commented that the people we share these mornings with are the essentials, and that our creations grow in part out of that rich personal connection. 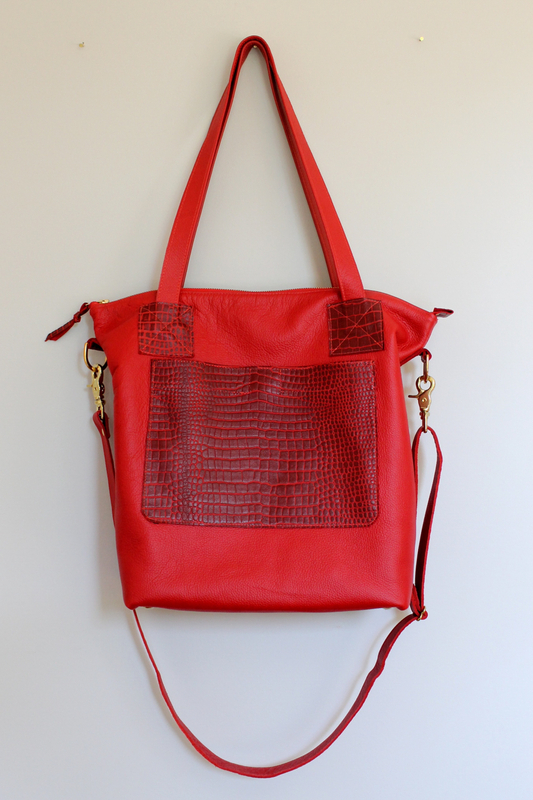 A new red Delta tote is under construction. I like the wax print from Nigeria that I am using for lining. I’ve been doing some research on these wax prints and they have a complicated heritage, beginning in Indonesia. You can read about their connection with Africa and their emergence in modern fashion here and here. I bought this particular wax print–they come in three yard pieces–last year at the market in Kisumu. The bold graphics are so appealing and the colours work well inside the red Delta. This fabric is printed on both sides–an indication of its quality. Some of the imitations are printed on only one side. 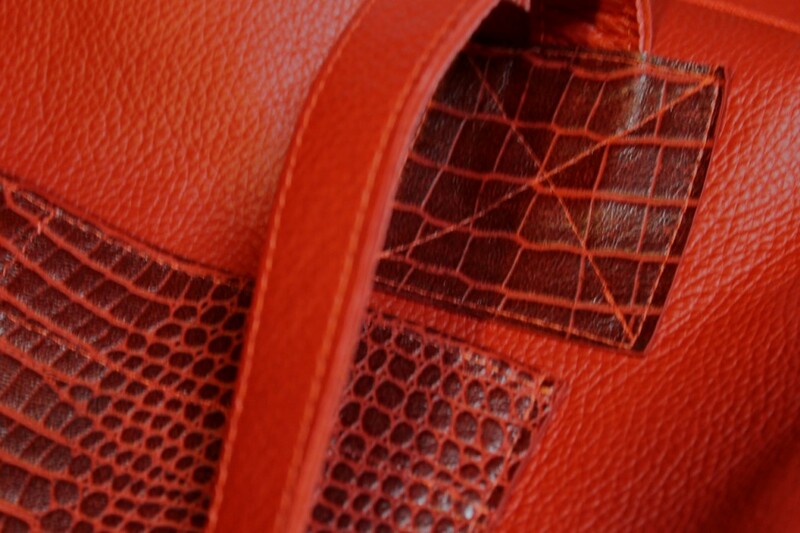 Here are some other glimpses of the new tote. It has the ‘delta’ features but is also unique–this one has brass fittings. 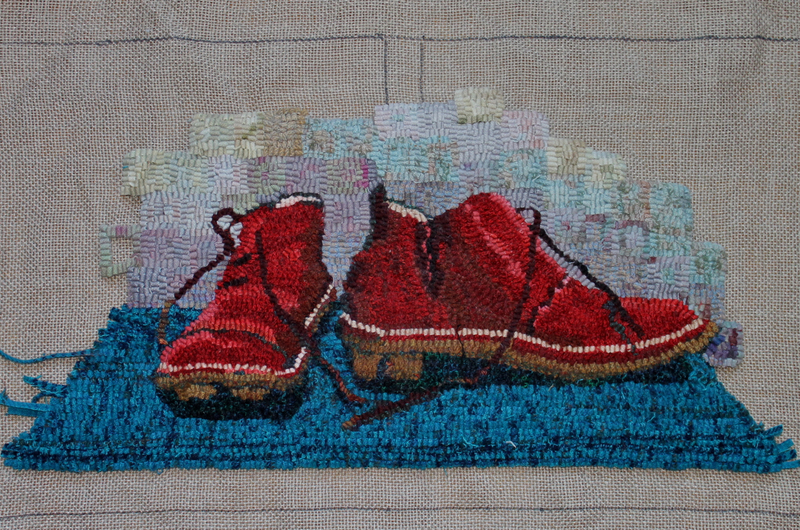 It should be finished by the end of the week. I think I have the value gradation figured out now. As I have said earlier, this is a learning exercise and I have learned lots from it. The shoes were fun to hook and relatively easy. But the background proved a challenge. I wanted it to be interesting but it ended up being distracting. There are still a few things to change, but I think I can now move gradually into the lights. Still, the interplay of background and foreground is something I will continue to experiment with in future pieces–it intrigues me. I’ll post it again when the lights are in. You probably know the saying Value does all the work; colour gets all the credit. I’ve been thinking about that as I have been working on this background. I have been putting in squares and then taking them out when they clearly did not work. 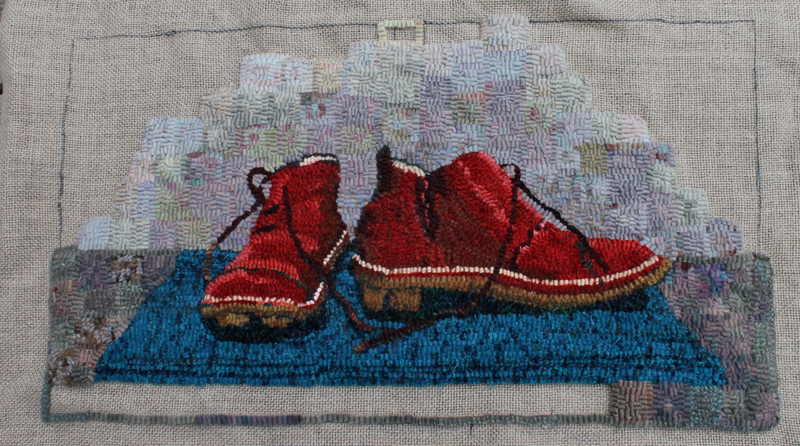 My original idea was to have light values behind the shoes working out to a border of darks. 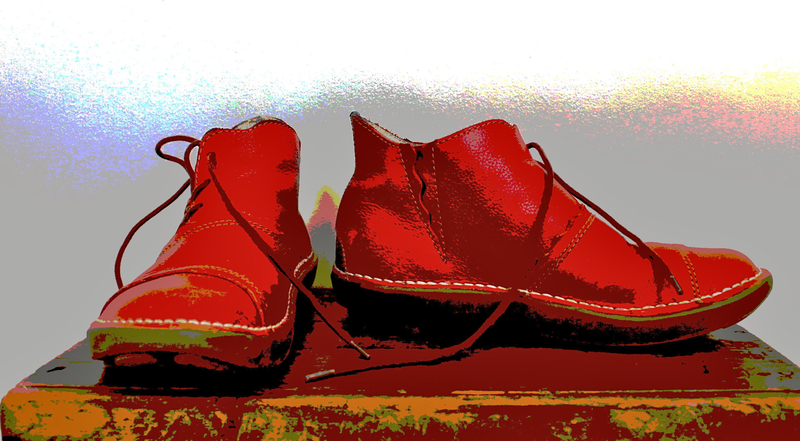 But when I saw that the light values were not working, I realized that it was medium values that were needed to enhance the shoes. 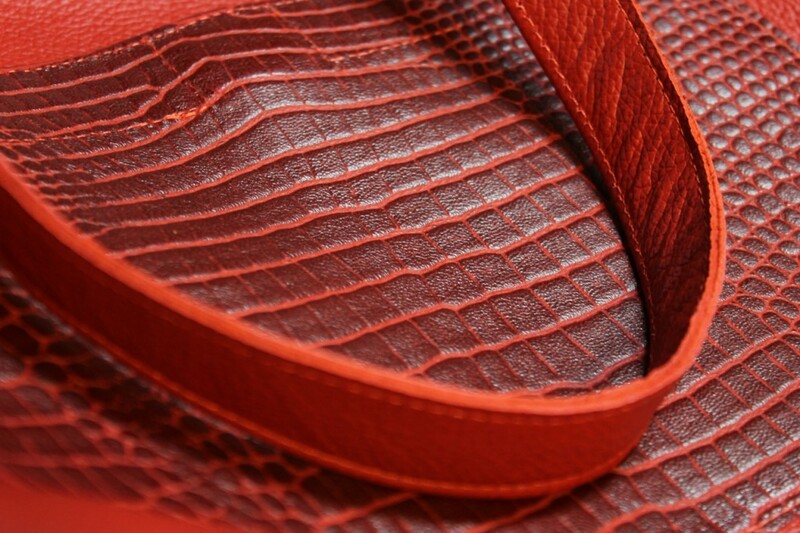 With a light value, the small strip of lining inside the shoes disappeared and the eye was confused. I took a look at the original posterized view of the shoes and my thoughts were confirmed. Medium values working out to light would work much better. After a lot of pulling out strips and replacing them with medium values, it looks like this. 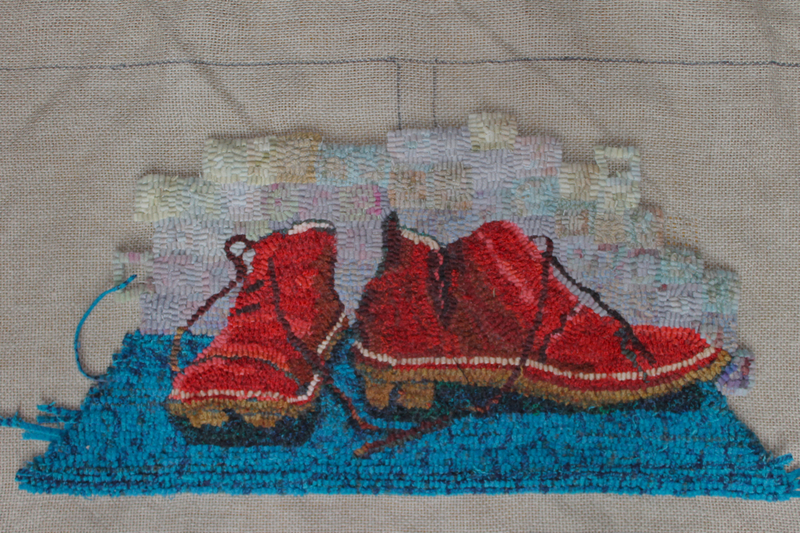 I’m gradually working to a lighter value at the edges–being careful to make sure to move only one value step away. Working in medium and lighter values is much harder than working in dark values–somehow the darks allow more flexibility and imprecision. The eye seems to pick up any irregularity in both colour and value on the light side of the scale, making the background a distraction, not an enhancement. This seems better now; I’ll post again when it is completed. 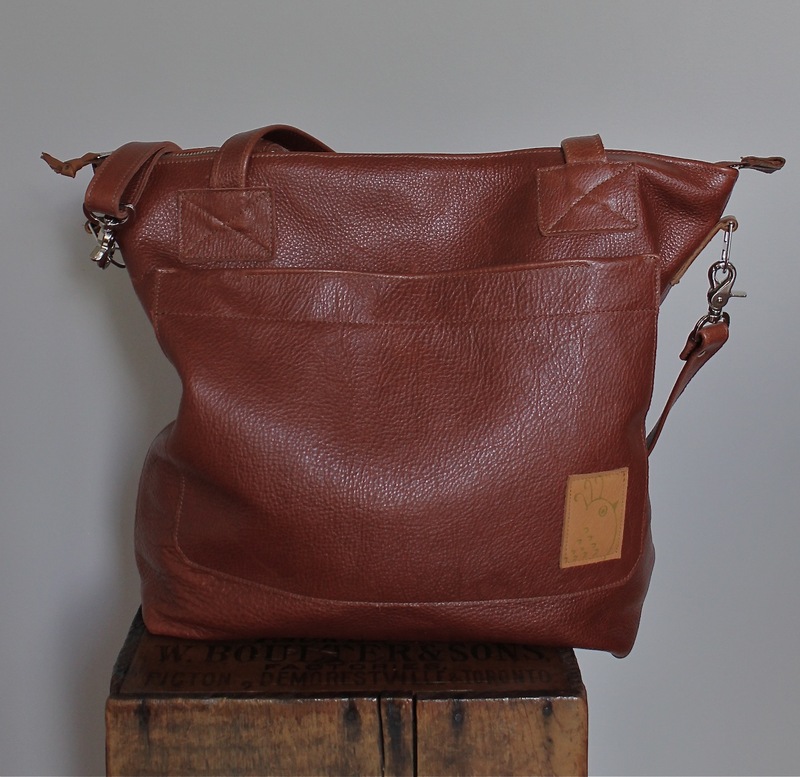 On a totally different note, the Toffee Delta is finished and will be on the blog and in the on-line shop by Tuesday. I have been waiting for some good weather to photograph it. What a crazy cold and wild weather weekend it was! And finally, we went out to Prince Edward Point to see the bird banding and do some sketching. It was so cold I had to stay in the car! 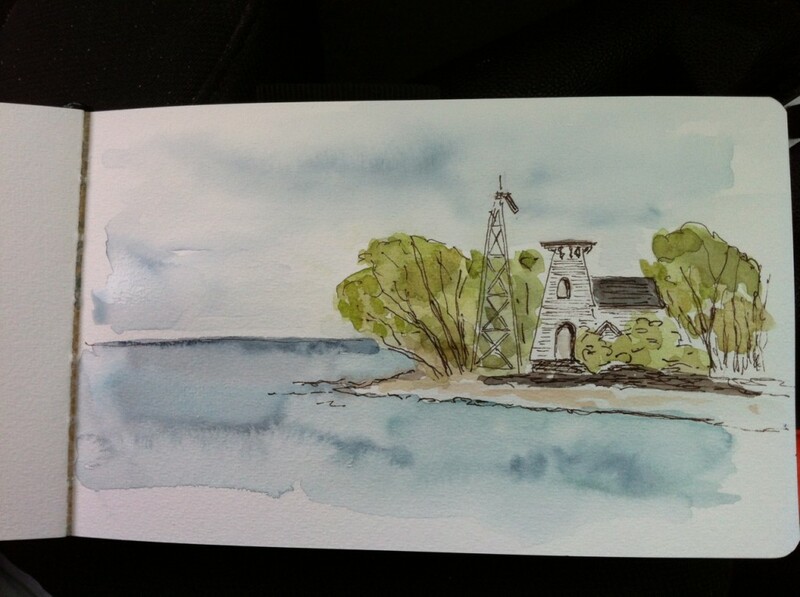 Here is the photograph and the very quick sketch of the lighthouse, sadly missing its topnotch. And, oh yes, I got to hold a Baltimore Oriole at the banding station–magnificent! I was delighted to receive a new piece of hooking from Catherine in Matangwe, Kenya. Although I was in Matangwe teaching hooking for several weeks, Catherine joined us only in the last two days. But, she learned quickly and completed her first piece before I left, making a special trip to the clinic to make sure that she gave it to me personally. And then this week this one arrived! As you can imagine, supplies in Kenya for rug hooking are very limited–but somehow she has found enough t-shirt pieces to make a well-designed piece. 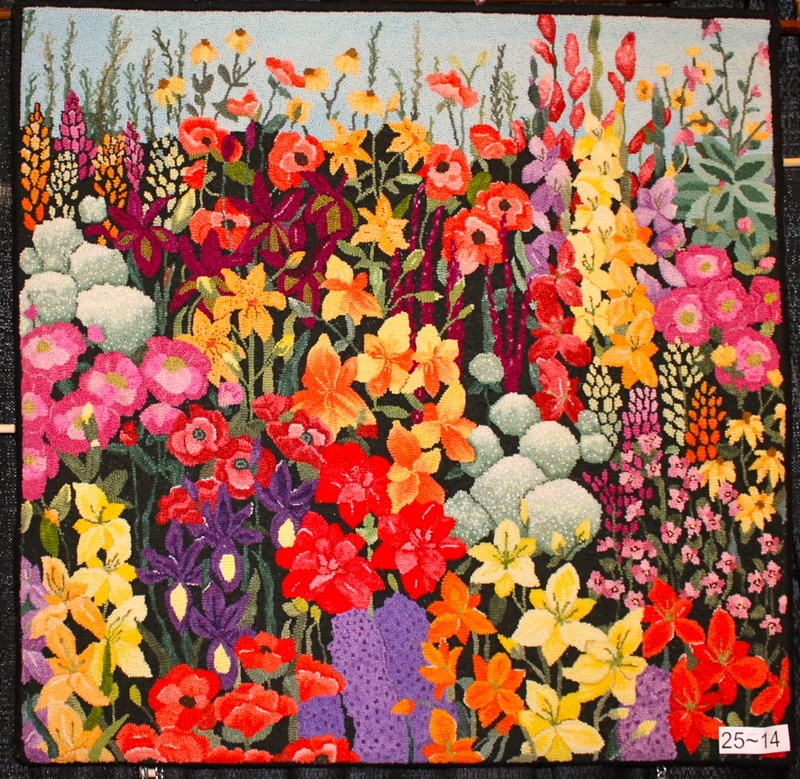 I am delighted and have great hopes that the women will be producing small rug-sized pieces next year. 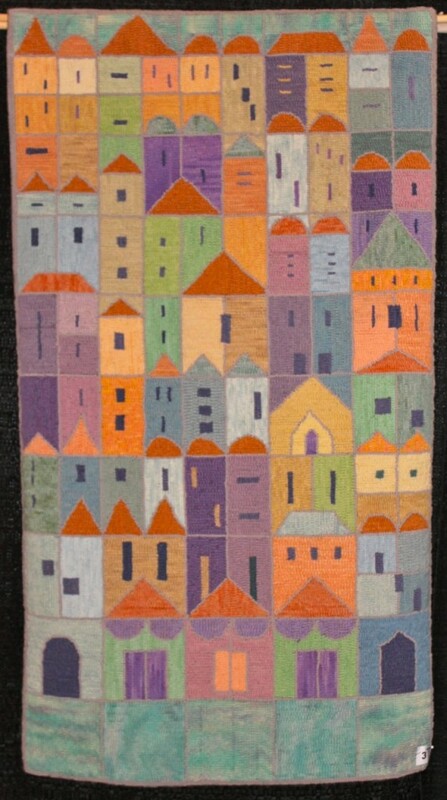 All the small hooked mats made by the women in Matangwe will be on display at the OHCG Annual in Kingston. 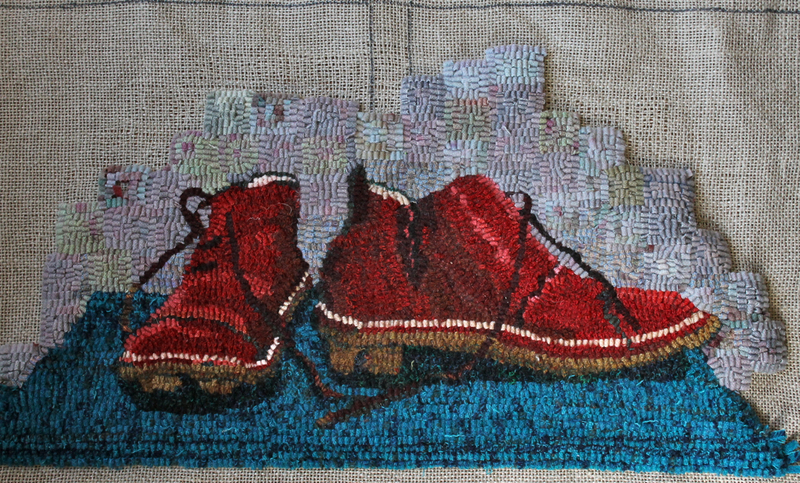 And here are the shoes at this stage. This background is proving more challenging than I expected. I knew that the values would take special care–but I wasn’t prepared for the issues with colour. Because the pieces I am using are spot dyes and marbelized, the background has more colour than I want in places. I find some of the turquoise distracting and think it has to go! I’ll continue to work with it and post an update on Monday.